Click here to Download 2019 Class Schedule. Discover the fun, excitement and creativity of watching your fabric unfold as you explore the art of weaving. Classes in weaving are tailored for all skill levels, from beginner to advanced. Students learn the basics skills involved in fabric design, project planning, loom preparation, weaving the fabric and finishing the final project. 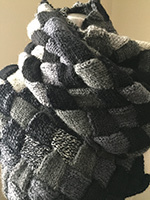 Whether you are looking to create wearables or textiles for your home the possibilities are endless for combining yarns and textures with pattern to create one of a kind handwovens. 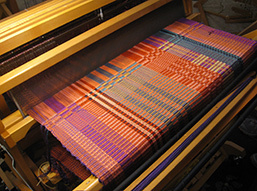 We also offer classes and workshops on special techniques and topics for more experienced weavers throughout the year. Learn the fundamentals of hand knitting and create your own knit fashions. Our knitting classes will teach you the basic stitches, pattern reading, yarn selection and finishing techniques. Additional skills are incorporated into each class as you become more proficient. Special project and technique classes are scheduled throughout the year to expand your knitting skills. 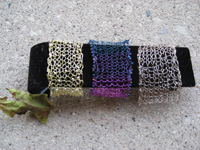 We are excited to introduce machine knitting to the lineup of fiber art classes offered in the studio. 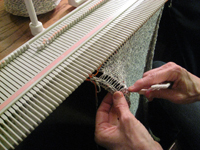 Learn the basics of machine knitting from start to finish. Machine knitting class is specifically designed for the Studio LK150 Mid-Guage Knitting Machine. Classes cover machine set-up, stitch patterns, gauges, tension swatches and more in preparation for project design/knitting. Students in advanced classes create fully fashion garments. Express yourself in handmade felt. The options are limitless. 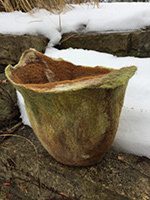 Our felting program includes classes in a variety of felting methods. All techniques start with top quality wool fibers to wet felt, needle felt, nuno felt or combine techniques. Each class is geared to creating a finished product. One of a kind scarves mittens, wrist and leg warmers, hats, slippers, nuno scarves, bowls, 3-d sculptural figures and geodes are a sampling of the designs we include. If you love color and are curious to dye something, take your color passion to the next level in our dyeing classes. 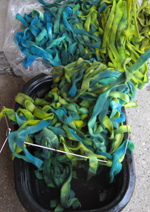 Learn to coordinate colors and dye/paint fibers, yarns, or silk fabric with professional dyes. From rovings for spinning or felting, wool fabric for rug making, warps for weaving and shibori silk scarves each class will guide you through the dyeing process: from proper fabric preparation and the safe handling of dyes, to how to set the fabric to get the most color from the dyes. Come join us where your creativity is only limited by your willingness to get your hands dirty. Paper is fiber too! 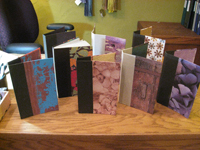 The expressive art of bookmaking adds another form of fiber art classes to Fiberwood Studio. A number of book styles are taught, from personal journals and woven books to pop-up style construction. The possibilities are endless and you will want to make them all. The instructors at Fiberwood Studio have so many interests and talents that we include a number of unique and diverse fiber art classes throughout the year. Spinning, textile techniques in metal, kumihimo braiding, coiling, soft sculpture, viking knit, adding beads to your work, and crochet are just a few of the topics we have introduced in previous years. Basic design is covered in classes about color, yarn combinations, using your stash, closures and all about fibers. You never know what we will come up with next, so check the schedule often.